What do you see staring back at you in the mirror each morning? Got news for most of you readers....we are no longer the young folks we used to be. But I am ok with that. It is the same in the bird world. Each day the birds come and do their morning thing, look for free food, chat with the neighbors and then spend some time to do some serious feather fixing and preening (Some of you probably have a similar routine, only we don't get free food). Old broken feathers need to be removed so young ones can grow. They have to make sure each primary is in good shape and in the proper place. It is hard to fly with broken down ole feathers. After my quiet time I made a request for some good bird photographs. A short time later, a Little Blue Heron flew in and began to hunt minnows. Shortly after that a Tricolored Heron landed and did some hunting too. I heard a familiar squawk and turned to see a Snowy Egret fly in to join the other two. The Snowy was not too interested in hunting yet. This bird had some serious preening to do. I watched this bird for about 20 minutes, fixing one feather after another, strut a bit and then preen some more. When it was all done it took a look at its reflection in the water. I would have swore I heard it say “My oh My, you are the best looking bird on the Broward! All I do lately is look at my gray hair in the mirror and say “you sure look older but not necessarily any wiser”. But just like this Snowy Egret..I’m Lookin Good”..Be Blessed today. Got to check under the wings for repairs..can't fly with old broken feathers. I see you there Mr. Doohickey...can't a bird preen in private? Psst...reflection...is Mr Doohickey still there? I sure am "Looking Good"....too bad you can't say that Mr Doohickey! The lyrics from the Moody Blues hit song by the same name chronicles the blues I am feeling today. It has been a strange week indeed. Lots of rain and clouds. The air conditioner crapped out again. Hillary isn’t the only one nearly fainting from the heat and humidity. The Editor is OK now that I have a couple of portable ACs hooked up while awaiting repairs. Time for some amusement to lift my spirits. I always find it on my dock excursions. Today was no exception. Another year round Broward resident is feeling blue too, in the form of a Little “Moody” Blue Heron. Per the Cornell Laboratory of Ornithology; “Adult Little Blue Herons are very dark all over. At close range or in good light, they have a rich purple-maroon head and neck and dark slaty-blue body. They have yellow eyes, greenish legs, and a bill that is pale blue at the base, black at the tip. Juveniles are entirely white, except for vague dusky tips to the outer primaries. Immatures molting into adult plumage are a patchwork of white and blue.” Ranging from South America and up the eastern US coastal states and Midwest to the Great Lakes, they are usually only seen in small numbers often tucked into hidden corners (IE moody). “The Little Blue Heron is a stand-and-wait predator, rather than a frenetic, dashing-about predator. They watch the water for fish and other small morsels, changing locations by walking slowly or by flying to a completely different site. They nest in trees, usually among other nesting herons and wading birds.” This was indeed the behavior I observed as I watched this moody little heron hunt for food. Its patience was aptly rewarded with a big fat Broward shrimp breakfast snack. Life is indeed strange at times. As the lyrics say: “The sea will not wait”. But patience is rewarded. The parts have arrived and now my ac is back on line..Life is good. Blessings. All the Harvest Moon did for me was make me blue! The Little Blue Heron is a stand a wait hunter.. I see something ...isn't life strange? How hard men will try,,,and Little Blue Herons too! Can we ask for more? Another fine shrimp snack please! The sea will not wait....so down the hatch! Wish I could be in your eyes,,,oh, that is just me...Isn't life strange? Tales from the Lizard Lounge. I glance outside and see it! A huge wake moving towards the dock. I call for the Editor to come quickly. We head for the Lizard Lounge. Swimming gracefully beneath the muddy waters, a huge whiskered head emerges and veers towards a clump of marsh grass. As it slips beneath the surface, we see the marsh grass begin to disappear as a graceful manatee munches on the local marsh grass. It reminded me of a bunch of hungry after-Sunday-Service-churchgoers hitting the local salad bars at their favorite feeding trough. We were not the only one watching the manatee. A Little Green Heron was also seen discussing the morning events with a young Great Blue Heron and George the Yellow-Crowned Night Heron. The Little Green Heron then flew over to the dock for a closer look. Holy Cow! "Look at the size of that thing" it appeared to say. The heron then noticed the schools of minnows being stirred up by the manatee's sweeping tail. Time to join in the morning feed! " Last one to the trough is a rotten Heron" thought the Little Green! Hmmm..better scare away the competition first..Soon the other local herons, (the Little Blue and Yellow-crowned) were all passing the word that a ferocious sea monster was loose on the Broward and they better fly and feed elsewhere. The Little Green Heron laughed all the way to the waiting minnows stirred up by the manatee. I glance towards the marsh channel as another fast moving wake and then a large dorsal fin break the surface. This wake was being made by a local bottle nosed dolphin chasing one of the many mullet cruising down the Broward. The dolphin is not interested in the salad bar. They prefer fresh fish instead. A whiskered manatee nose appears and sniffs for some sweet marsh grass..
Hey George, Did you see that big wake? Nope, where was it? Hey Georgia, did you see a big wake? I just saw a dolphin go by chasing mullet..
What is that big thing in the water? A sea monster! A sea monster! I'm leaving said the Little Blue Heron.every bird for themselves! I'm leaving too said the Tricolored Heron..
Now that all those other dummies are gone, more minnows for me..chow time..
“The end of labor is to gain leisure. ~Aristotle” According to Doug Larson (a columnist and editor in Wisconsin) “If all the cars in the United States were placed end to end, it would probably be Labor Day Weekend. “ I am pretty sure Aristotle got it right but Mr. Larson sure gives us an accurate description of today also. So what did you do this Labor Day weekend? While many on the east coast and Florida are cleaning up or preparing to hunker down from Hurricane Hermine, I am blessed to be retired and able to take some time off to go to the beach as a Bird Steward volunteer. I want to share with you some of my feathered friends found on Huguenot Park Beach this past summer. Huguenot Park Beach is a city owned recreation site that is one of the few places you can still drive your auto on the beach, unload the chairs and umbrellas and put up an awning and grill and have a great time. It is also home to many shorebirds that nest in the dunes and raise their young in this small sandy shore habitat. The city and park naturalist have their hands full keeping both bird and bikini bound populations in peaceful coexistence. My hats off to the staff at Huguenot. They have done an awesome job! I have decided to just let the photos of the birds of Huguenot beach do most of the rest of the talking. Their beauty speaks volumes. "Freckles" the Sanderling scampers across the surf zone in search of snacks..
A pair of Black Skimmers watch over there young juvenile nearby..
"Thank you for coming to Jr's Baptism" ...Royal Tern Chick gets "baptized" in the Atlantic Ocean Surf.. 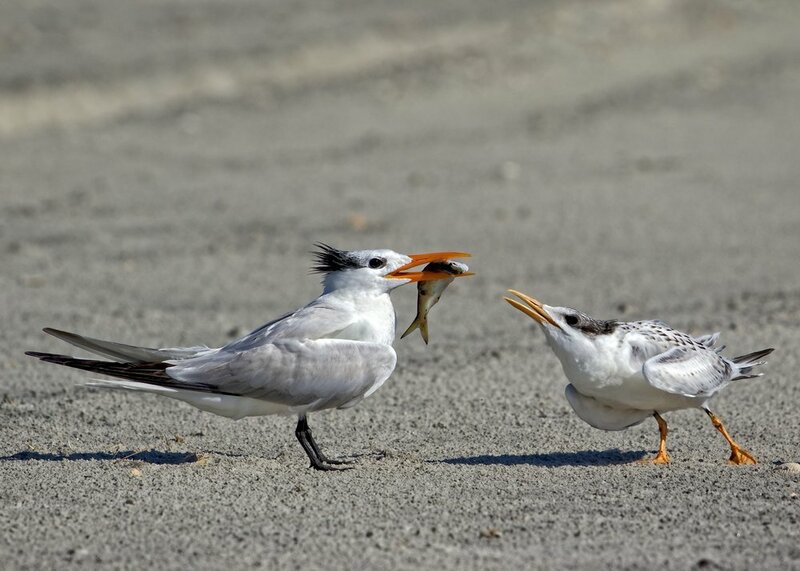 Sandwich Tern heads out to get another fish sandwich to feed the hatchling..
Scram chick, this fish is for my girlfriend Wanda..
Show me what is under those feathers and I'll give ya this fish..Wow! Yellow Beak, Black Feet....Great Egret..
Black-bellied Plover..the fall migrations have begun..this bird breeds in the Arctic regions..